The first of The Nobile Folios explores Bathers 1917 - 18 by the acclaimed British painter Mark Gertler (1891 - 1939). The painting is set alongside Shaun Levin's original short story 'Trees at a Sanatorium'. 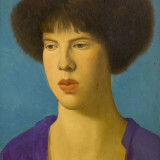 Mark Gertler was born in Spitalfields in London's East End in 1891, the youngest son of Jewish immigrant parents. Bathers 1917-18 was painted when Gertler was only 26 and dates from a period of intensive research into Cézanne. Bathers is amongst his seminal works from the World War I period. Shaun Levin's story 'Trees at a Sanatorium' was written specifically for this publication. It is a meditation on landscape and the importance of intimacy in artistic creation. Levin wrote this story visiting places where Gertler stayed - whether out of choice or necessity - from the sanatorium at Banchory in Scotland, to Catalonia, to Paris and the gardens at Garsington Manor.